The structure of egocentric networks reflects the way people balance their need for strong, emotionally intense relationships and a diversity of weaker ties. Egocentric network structure can be quantified with ’social signatures’, which describe how people distribute their communication effort across the members (alters) of their personal networks. 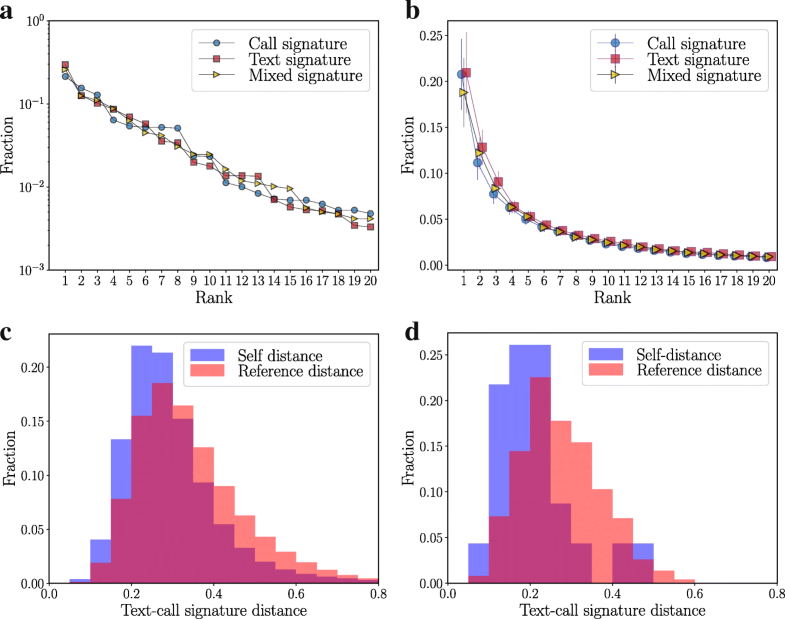 Social signatures based on call data have indicated that people mostly communicate with a few close alters; they also have persistent, distinct signatures. 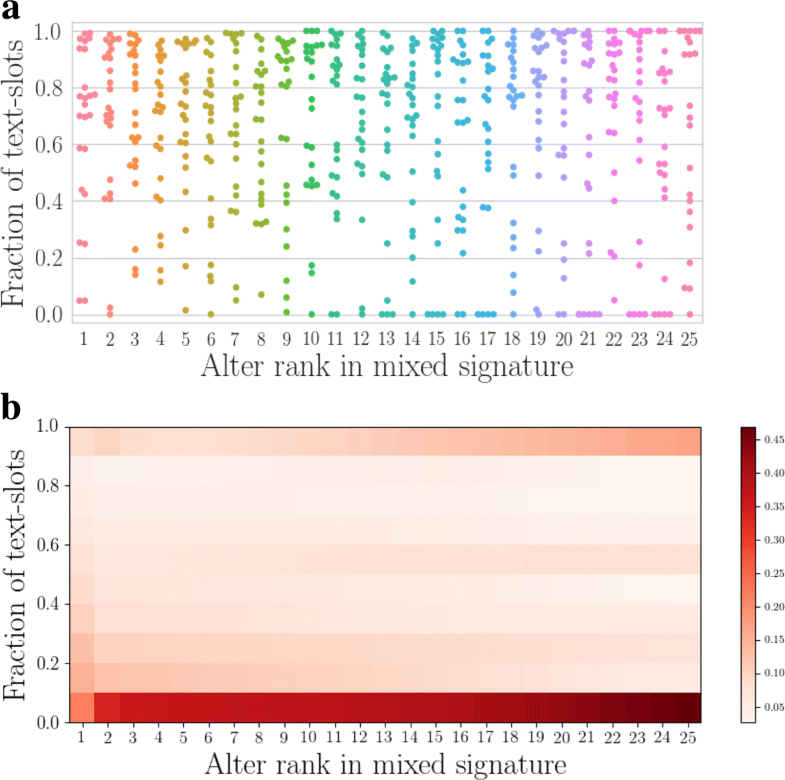 To examine if these results hold for other channels of communication, here we compare social signatures built from call and text message data, and develop a way of constructing mixed social signatures using both channels. We observe that all types of signatures display persistent individual differences that remain stable despite the turnover in individual alters. We also show that call, text, and mixed signatures resemble one another both at the population level and at the level of individuals. The consistency of social signatures across individuals for different channels of communication is surprising because the choice of channel appears to be alter-specific with no clear overall pattern, and ego networks constructed from calls and texts overlap only partially in terms of alters. These results demonstrate individuals vary in how they allocate their communication effort across their personal networks and this variation is persistent over time and across different channels of communication. Social relationships that are strong and supportive are fundamentally important for health and well-being, in both humans and other primates (House et al. 1988; Lyubomirsky et al. 2005; Wittig et al.Holt-Lunstad et al. 2010; Manninen et al. 2017). While close, emotionally intense relationships provide support and cohesion, weaker ties have been associated with the benefits of diversity and access to resources outside one’s everyday social circles (Granovetter 1973; Burt 1995). At the same time, maintaining social ties comes at a cost: time and cognitive resources are finite (Miritello et al. 2013; Miritello et al. 2013). This cost is particularly high for close relationships (Roberts et al. 2009). As a result, personal networks typically have only a few close ties and many weak ties. This is visible both at the level of entire social networks (Onnela et al. 2007) as well as in how people structure their personal networks (Saramäki et al. 2014). The way people balance their need for strong, cohesive ties and weak ties that lead outside their closest network is reflected in so-called social signatures. The social signature of an ego measures the fraction of communication targeted at alters of each rank, when the alters are ranked according to this fraction. Social signatures therefore quantify rank-frequency relationships of alters in egocentric networks. In (Saramäki et al. 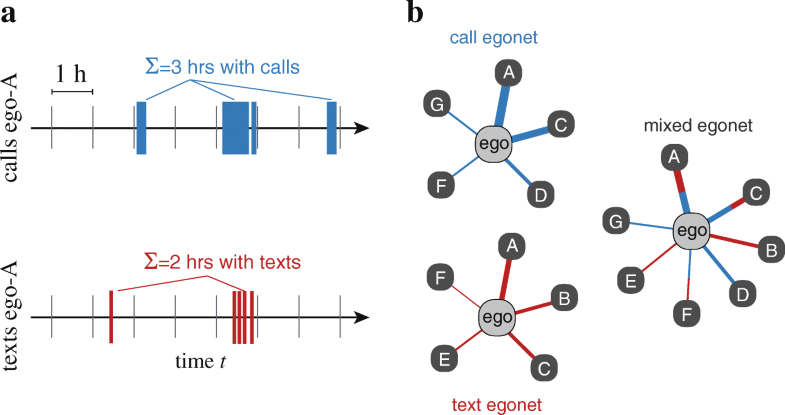 2014), it was shown that people place their mobile telephone calls to their alters very unevenly across their ego networks, so that a few closest alters get a disproportionate fraction of calls. This is reflected in social signatures that typically decay slower than exponentially. It was also shown in (Saramäki et al. 2014) that each individual has their own, distinctive social signature that persists in time, even when there is a large amount of turnover in the ego network. Similar observations were made in (Centellegher et al. 2017) with a different dataset on mobile telephone calls. However, social relationships are shaped and maintained through a diversity of communication channels (Vlahovic et al. 2012; Reid and Reid 2005; Nanavati et al. 2008; Wang et al. 2013; Zignani et al. 2014; Quadri et al. 2014). People do not use these channels uniformly – rather, the choice of channel depends on many factors. These include the type of relationship (nature of social tie), general channel preferences, the time of the event (social norms) and the reason for communicating; see, e.g., (Reid and Reid 2005) on why texters text. To examine if the properties of social signatures are generalizable and genuine features of egocentric networks, it is therefore important to look at data from multiple channels of communication, both separately and together. Combining information on different channels can, however, be problematic because of their intrinsic differences. For example, the number of calls or their total duration is typically used as a proxy for tie strength in mobile telephone call data (Saramäki and Moro 2015). But text messages, another common form of communication via mobile devices, have no duration, and the number of text messages between an ego-alter pair is not directly comparable to the number of calls between that pair. While one call can be thought to represent one conversation, one text message is typically only a part of a longer conversation. In this paper, we study social signatures that are based on calls, texts, and both. To this end, we develop a way of constructing weighted ego networks from time-stamped communication data that makes different channels more comparable (see Fig. 1), and also allows for the construction of mixed social signatures based on both call and text message data. We apply this method to two data sets on mobile telephone communication, and observe that both single-channel and mixed signatures are persistent over time, as observed earlier for calls-only signatures. We also observe that the call and text signatures are surprisingly similar for each ego. 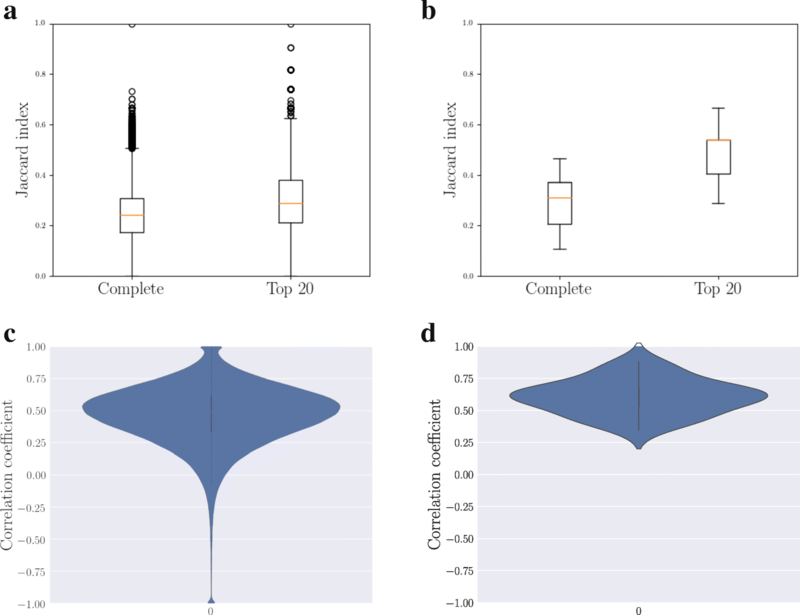 This is unexpected, because at the same time, the call and text networks of most egos overlap only partially, and there are no clear patterns of channel preference: the choice of channel appears independent of alter rank in mixed signatures. We use two data sets of mobile telephone calls and text messages (see Table 1). Data set DS1 comprises the Call Detail Records (CDRs) for calls and text messages of the anonymized customers of a mobile operator in an European country, collected over 7 months (see, e.g., (Karsai et al. 2011; Kivelä et al. 2012)). We applied an activity threshold and retained only users with more than 20 calls and more than 7 text messages per month, retaining 506,330 users. Data set DS2 contains the times and recipients of outgoing calls and text messages for 24 students in the UK (Roberts and Dunbar 2011; Saramäki et al. 2014). The data collection period is 18 months, during which the students graduated from high school and moved on to University or work. As our aim was to construct social signatures and study their persistence in time, we divided both data sets into two equal-sized consecutive time intervals (3.5 months each for DS1 and 9 months for DS2); this was for being able to compare the stability of the shapes of the signatures for the first and second halves. The choice to split into two was merely for convenience; please note that in (Saramäki et al. 2014), DS2 was analyzed using three intervals, yielding similar results for calls. Social signatures are calculated from weighted egocentric networks, where the link weights represent the amount of communication between the focal ego and the ego’s alters. Social signatures measure the fraction of communication to alters of each rank, when the alters are ranked according to this fraction. In (Saramäki et al. 2014), the number of outgoing calls that took place during the data collection period were used as weights. However, when there are multiple channels, the question of how to define weights is not straightforward. The simplest solution would be to use the number of communication events as the weight for all channels. However, this is problematic. In our case of calls and texts, as disussed above the numbers of calls and texts cannot be directy compared. One call can be associated with one conversation, while one conversation by texting may amount to a large number of individual text messages. Here, our aim is to make the channels more comparable by focusing on their timelines and coarse-graining events in time. We do this as follows: we take the timeline of each ego-alter link, and divide it into time bins of one hour. Note that one hour has been chosen for convenience and to be clearly longer than the time scale of tens of seconds to minutes associated with correlated calls or texts (Karsai et al. 2011; Backlund et al. 2014)). Then, for both calls and texts, we count the number of bins which contain at least one communication event (see Fig. 1a). Thus we count the number of one-hour time bins in which at least one communication activity takes place. These counts are then used as link weights for the egocentric networks: e.g., a weight of w=5 indicates that there were five hours where there was call activity with the alter. Calls that begin in one time bin and stretch along several time bins contribute accordingly to several units of weight. Defining link weights on the basis of time bins also makes it possible to construct mixed link weights, as one can count the number of time slots where either at least one call OR one text message took place. An advantage of this method is that it can be used to calculate link weights that quantify the amount of communication or social interaction in any channel, as long as the time stamps of interaction events are available for each ego-alter link. where the alters j are sorted by weight in decreasing order and k i is the degree (number of alters) of i.
where σ1 and σ2 are two social signatures, as defined in Eq. 1, and H(σ) is the Shannon entropy of σ. The Jensen-Shannon divergence is a generalized form of the Kullback-Leibler divergence. The square root of the Jensen-Shannon divergence can be used as a distance function. Because the JSD can deal with zero probabilities, it allows us to compare social signatures of different lengths, that is, signatures computed from egocentric networks with different numbers of alters, k1≠k2. To compare two signatures of lengths k1 and k2 where k2>k1, we append zero entries (w ij =0) to the shorter signature for k1<j≤k2 so that both signatures are of equal length. where σ1 and σ2 are the social signatures corresponding to the networks. As an example, the Jaccard coefficient between the call signature and text signature of an ego is defined as the number of alters the ego has contacted by both call and text in the period divided by number of alters the ego has contacted by call or text. If there is complete overlap between the alters contacted by call and text, then J = 1. If there is no overlap between alters contacted by call and text, then J = 0. We begin our analysis by demonstrating that all three types of signatures – call, text, and mixed – are persistent at the level of individuals, as was shown for call-based signatures for DS2 in (Saramäki et al. 2014). Here, we define persistence as the social signature retaining its shape over time, with individual level variation in JSD that is smaller than the average JSD between signatures in the whole population. To examine this persistence, we divide the data collection periods of the two sets into two intervals of 3.5 and 9 months for sets DS1 and DS2, respectively. We then calculate the weighted egocentric networks for each ego in each interval. As explained in detail above, we use the number of one-hour time bins with calls, texts, or either for determining the link weights between the ego and alters. We compute the social signatures for each egocentric network and each interval by ranking alters according to their weight and calculating the fraction of weight at each rank. Following (Saramäki et al. 2014), we then calculate self-distances by computing the JSD between an ego’s own signatures in consecutive intervals. We also calculate reference distances by computing the average JSD between the signature of the ego and those of all other egos. We repeat these calculations for both channels (calls and texts) as well as mixed networks (calls and texts). The distributions of self and reference distances of call, text, and mixed signatures are displayed in Fig. 2. For all three types of signatures and for both data sets, the bulk of the distribution of self-distances clearly lies below the reference distances. Self-distances are on average smaller than the distance between the signatures of two random egos, and there is less spread in their distribution. These differences in the distributions of Fig. 2 indicate that the changes of an ego’s signature in time are smaller than the variation of signature distances in the population, whether calculated from calls or texts or both. This means that the individual differences in signature shapes are a real feature of the egocentric networks instead of random variation resulting in noisy, unstable signatures. The persistence of social signatures is therefore not only a feature of egocentric networks built from phone call data, but a more general phenomenon. We have now established that the three types of signatures are persistent characteristics of egocentric networks. Next, we compare the shapes of these signatures, first at the population level and then at the level of individuals. It was shown in (Saramäki et al. 2014) that call signatures in DS2 are rather skewed: a small number of top-ranking alters get a disproportionate share of communications. We find that all three types of signatures show this skewed shape at the level of individuals and at the population level. This is seen in Fig. 3 that shows the three types of signatures of one person (a) and the population-averaged signatures (b). It also appears that the two types of single-channel signatures are more similar for each ego than they are between egos–the shapes of the call and text signatures of an ego look similar. This is confirmed by use of the JSD. We calculated the self-distances between an ego’s call and text signature as well as reference distances between all pairs of call and text signatures, aggregated over the entire period of observation. The resulting distributions for both data sets again indicate that self-distances are on average smaller than reference distances (Fig. 3). Even though the difference is slightly less pronounced than for distances of the same signature type between different intervals (Fig. 2), the shapes of call and text signatures of an ego appear to correlate. 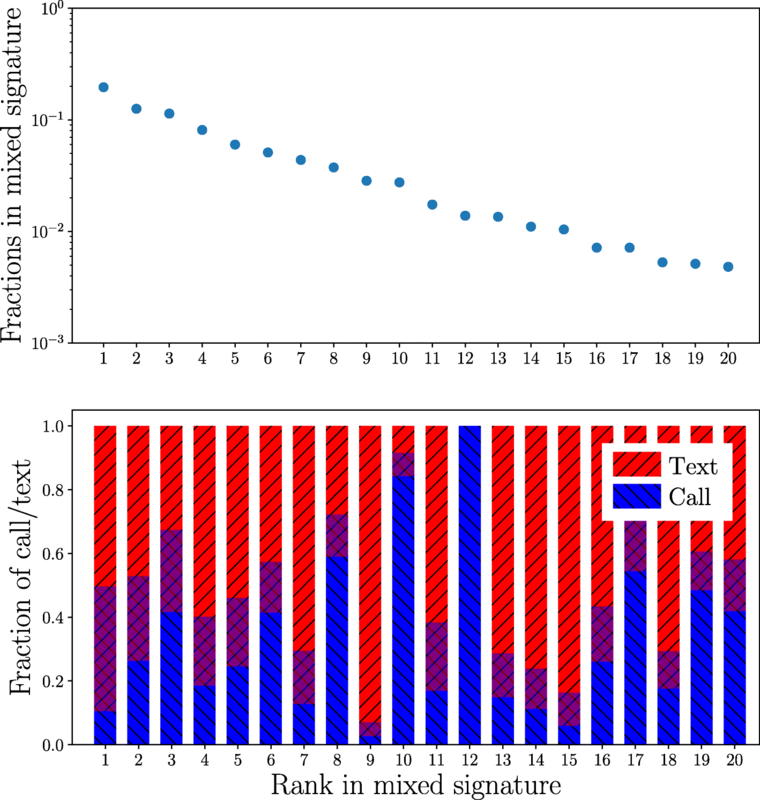 The similarity in the shapes of the call and text signatures of each ego would be expected if their call and text networks were similar and included the same alters with similarly ranked weights. However, this is not the case: the call and text networks of an ego are typically different. Instead of the same alters appearing in both networks, many alters are only called or texted, and therefore included in one network only. This is in line with literature on network-level differences (Nanavati et al. 2008; Wang et al. 2013; Zignani et al. 2014). This can be seen for both datasets in the distributions of Jaccard indices in Fig. 4a) and b), computed for the sets of called and texted alters of each ego. The values of the Jaccard indices are mostly low. This means that while some alters are in both networks, most alters are not. Also, as seen in the lower panels (c,d) of Fig. 4, the ranks of those alters who are present in both call and text networks correlate only moderately: an alter who is among the most called alters may receive a far smaller share of text messages. Next, we investigated whether there are systematic differences in the call and text networks of egos; such differences might explain the signature shapes and their similarities, despite call and text networks being different. To this end, we take a look at mixed egocentric networks calculated using both calls and texts, and investigate their weight composition. We focus on the share of calls and texts for each rank; note that since we are counting time slots, there are slots with both channels present. One example mixed signature and its weight composition are shown in Fig. 5. It appears that there is no clear pattern, except perhaps an slightly increased focus on calls around ranks 11-16. A likely explanation is that the choice of communication channel depends on features of the relationship in question other than its emotional closeness that correlates with ranks. This is supported by Fig. 6 that shows the shares of text messages in all ego-alter relationships of DS2 (top) and a large sample of ego-alter relationships of DS1 (bottom). In DS2, the only systematic feature is that alters at top ranks typically receive both calls and text messages, and the fraction of text-only and call-only relationships increases towards the lower ranks. Top relationships appear more balanced regarding communication channels in DS1 too. Beyond that, there are no systematic changes that depend on alter rank. Social signatures quantify how people allocate their communication across the members of their personal networks. 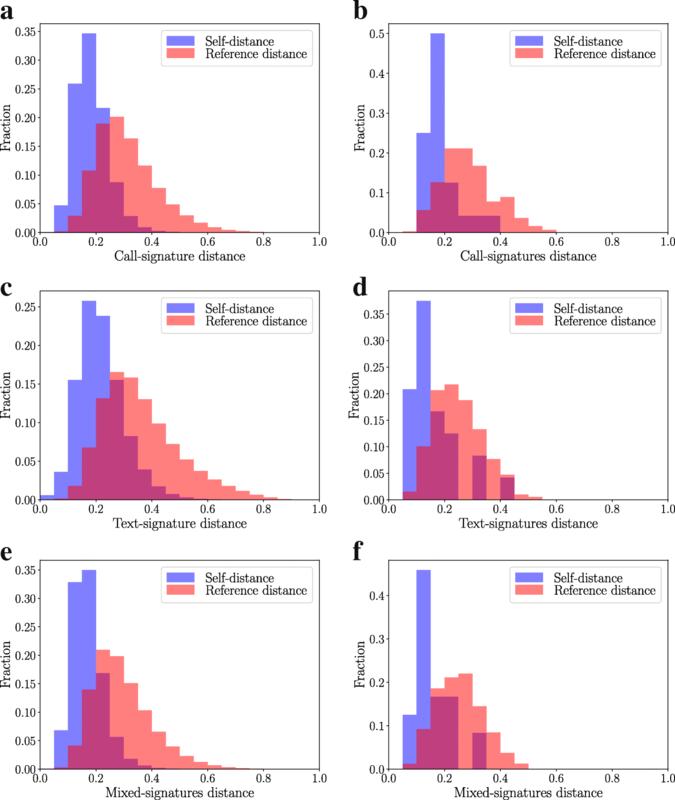 In this paper, we used two separate datasets to explore how social signatures based on calls, texts or both vary over time and across individuals. There were three key findings. First, individuals vary in how they allocate their time across their ego networks and this variation is persistent over time, despite a turnover of individuals alters in the network. This finding was initially reported in (Saramäki et al. 2014) using a small sample of 24 students of a similar age going through the specific transition from school to University or work (DS2 in this paper); (Centellegher et al. 2017) confirmed the finding for a data set of N=93. The current paper replicates this finding in a much larger, more demographically diverse sample of over 500,000 people. Second, this individual variation in social signatures was present across different channels of communication - phone calls, text messages and a combined network based on both calls and texts. This is despite the fact that there was little overlap in the individuals who were called and texted. Third, regardless of the channel, the top alters get a disproportionately large fraction of all communication. This is seen in the shapes of three types of signatures (calls, texts, and mixed). Thus individual variation in social signatures does not appear to depend on the channel of communication or the specific alters in the network at a particular point in time, but instead reflects a stable characteristic of how individuals distribute their communication effort across their personal networks. Why are the social signatures from different channels similar? One could envision an underlying complete egocentric network with tie strengths that measure the closeness of all the relationship an ego maintain with their alters. Within this network there is a distribution of tie strengths where there are few strong and many weak ties (Dunbar 2018). Then observations on one channel of communication would be incomplete samples of the underlying complete network (see, e.g., (Nanavati et al. 2008; Wang et al. 2013; Zignani et al. 2014) for studies on network-level differences between calls and texts). Individuals differ in how they allocate their communication across their network, some individuals allocating a greater fraction of communication to a smaller number of alters and others allocating communication more evenly across their network. Thus constructing the social signatures based on different channels of communication would still pick up this individual variation, even if the specific alters detected by the different channels of communication vary. There may also be less fundamental reasons: communication habits, memory effects, or similar. However, it has been shown that for calls, alter ranks do correlate with emotional closeness (Saramäki et al. 2014), which supports the first explanation. To fully understand which sample of alters is captured by different channels of communication, further research is needed on how people use different channels of communication to maintain their set of relationships to family and friends, and how this communication is related to the underlying tie strength of the relationship (Reid and Reid 2005; Vlahovic et al. 2012; Wiese et al. 2015). The finding that individuals have social signatures that are stable over time and persist despite the turnover of individual alters has now been shown in a number of samples from different countries and across different channels of communication including phone calls (Saramäki et al. 2014; Centellegher et al. 2017), text messages and combined call and text networks (this study) and email (Godoy-Lorite et al. 2016). Given the robustness of this finding, further research is now needed on the causes and consequences of individual variation in social signatures. Whilst everyone is subject to similar fundamental time and cognitive constraints on sociality (Dunbar 2018), the way people choose to allocate their communication effort across their networks shows stable individual variation. Some of this individual variation appears to be due to personality characteristics (Centellegher et al. 2017), which are also broadly stable over time (Caspi et al. 2005). Other characteristics that may be associated with individual variation in social signatures are age and gender, which are linked with variation in communication patterns (Bhattacharya et al. 2016) and friendship styles (Roberts and Dunbar 2015). Further, given the importance of social relationships to health and well-being (House et al. 1988; Lyubomirsky et al. 2005; Wittig et al.Holt-Lunstad et al. 2010; Manninen et al. 2017) individual variation in social signatures may have consequences for outcomes such as stress and loneliness. Whilst all people distribute their communication very unevenly across their network (Saramäki et al. 2014), some people focus an even greater proportion of their communication on a smaller number of alters. Further research could examine how these different patterns of time allocation across the network are linked to well-being, particularly during times of network change which put pressure on the time required to maintain relationships, such as the transition to University (Roberts and Dunbar 2011) or entering into romantic relationships (Milardo et al. 1983). Further, it would be important to see that our results can be replicated with other data sets containing calls and texts; as usual for this kind of data, our data cannot be made public because of privacy reasons. To conclude, this study demonstrated using two separate samples that there is individual variation in the way people allocate their time across their social networks, and these social signatures are persistent over time and across different channels of communication. We thank A.L. Barabási for providing data set DS1. SH and JS acknowledge funding from the Academy of Finland, project n:o 297195. The source data used in this study cannot be made publicly available because of privacy restrictions. Saramäki et al. (Saramäki et al. 2014) has some Supplementary Data in relation to DS2. SGBR and RIMD conceived and performed the experiments; SH and JS analyzed data; SH, JS, SGBR, and RIMD wrote the paper. All authors read and approved the final manuscript.